Irene is tapping on our front door right now with some heavy rain but we won't get the worst of it until tomorrow. My main concern is the possibility of losing power, which would mean I would not be able to sew! Other than that, we should have no long term side effects of this storm, unlike those nearer to the ocean or in low lying areas who could be terribly affected by flooding and storm surge. Keep safe! 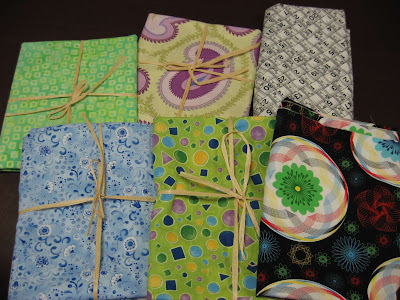 Keepsake Quilting now has a clearance room where they put all their fabrics they are trying to get rid of. 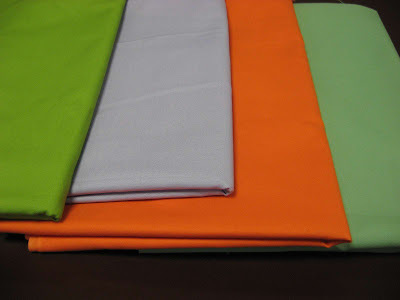 I found a shelf with lots of different Kona Solids for practically nothing, so I picked out a few colors and purchased a couple yards of each. 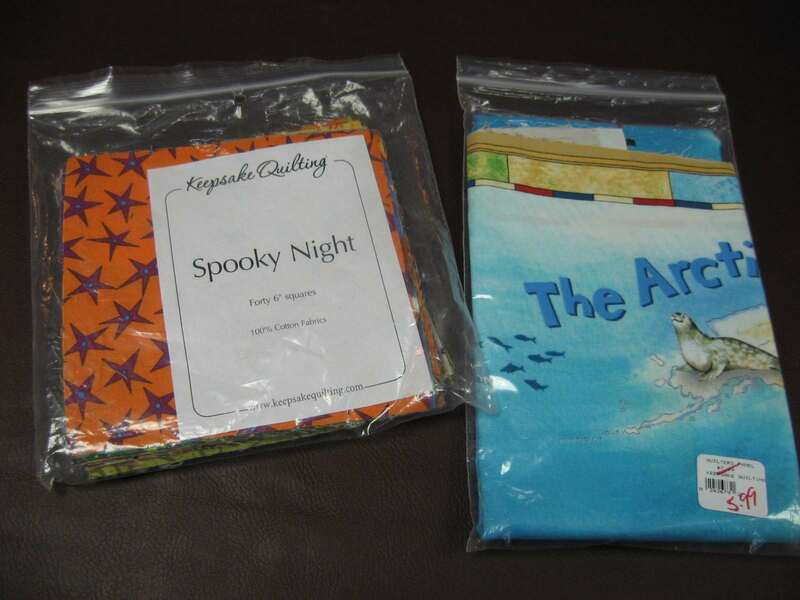 These make great bag linings as well as fill-in type of fabric for other projects. Besides the sale prices in their clearance room, they were also offering an extra 25% off any packaged kits so I picked up this cute little world map panel and also this pre-cut package of 40 6-inch squares of Halloween prints. Those will be fun to make into something interesting! 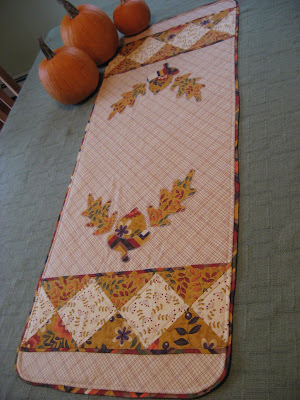 Then I purchased a few remnants that I found appealing, and a couple pieces of yardage that also caught my eye. 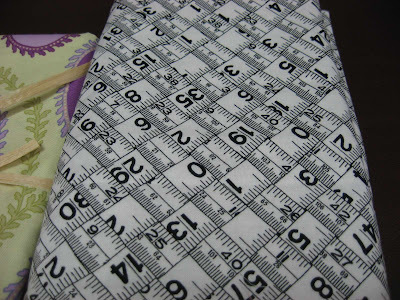 I love this fabric with it's woven tape measure print! 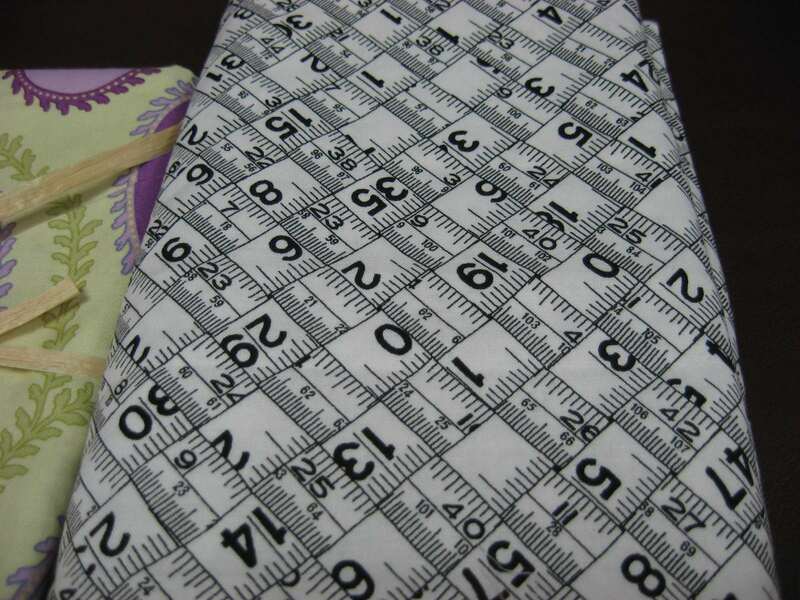 This will be fun to use as a lining for a sewing bag or sewing machine cover, don't you think? And this bright, colorful fabric has all the wonderful designs on it that I used to make with my Spirograph when I was a kid! Childhood memories printed on fabric...how could I resist? 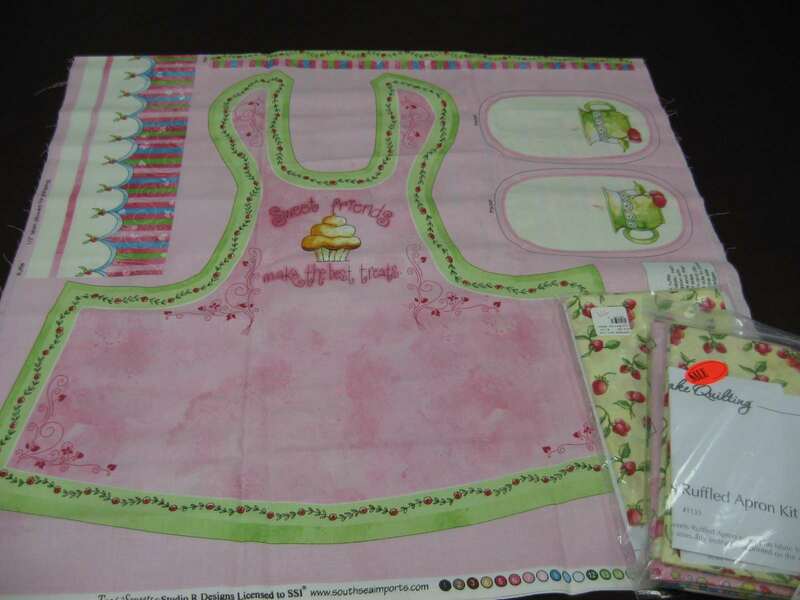 The last item I purchased is this darling little kit for the sweetest apron you've ever seen! The kit came with this panel, of which you can only see half here, and the piece of fabric you can see peeking out there on the lower right with strawberries on it for the lining. I actually purchased two of these kits because they were priced so low and were so darn cute! I've already made one, and will probably save the second one to donate to my children's school for a theme basket raffle at Christmas time. So that was my vacation shopping haul for this summer. As I sit here with the air conditioner on because of the extreme humidity and heavy rain outside, and the sky darkening all around me, it's hard to believe summer is just about winding up here. My two little ones start school on Tuesday, and my big one who's all married and gone now will also be starting back to her third year of college in a few weeks. I have lots of projects on my list of things-to-do in my sewing room, besides all the other Mom-type things ... you know what I mean... driving the kids here, there and everywhere, cub scouts, soccer (one on a travel team and one still in-town this year), helping out at school, hopefully finding the time to plan a few sewing workshops here at home for some friends, and preparing for this vendor fair where I will have a table at the end of next month. All the usual stuff of family life, and I just love it! I sincerely hope that you are loving all the things that fill up your life these days too! I hope you stay on the grid! I hope Irene does not come knocking too hard on your door! I remember all too clearly Hurricane Ike - two weeks with no power - not a fun experience! 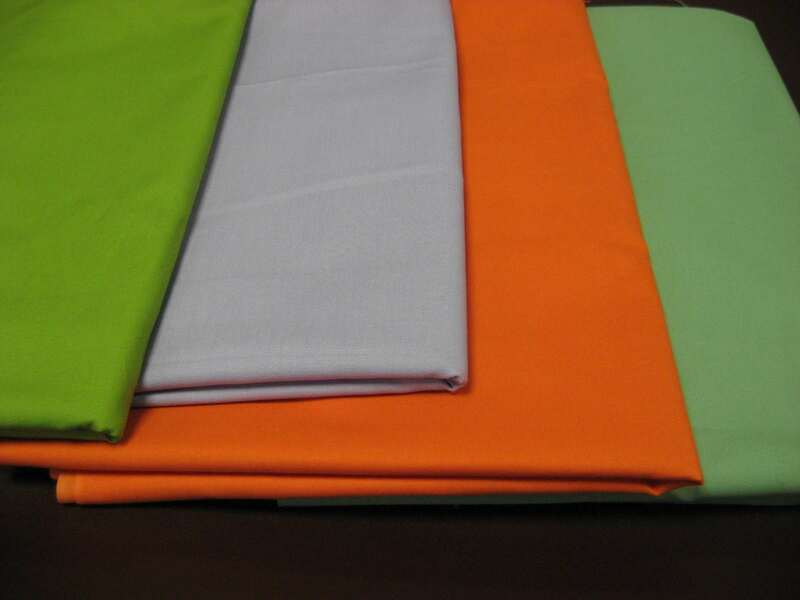 I will be anxious to see what you do with all this wonderful fabric! I love your summer shopping purchases. I wish I would be near there. I love reading your blog and etsy shop. Good luck with the storm. 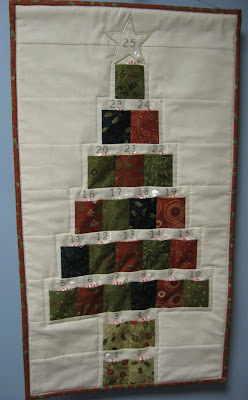 It would be nice to be able to have nothing to do but sew. But if the storm comes then I am sure you will have much more important things to do. Here's hoping you keep your power, and are safe! Wow Mary Grace...you always find the buys! 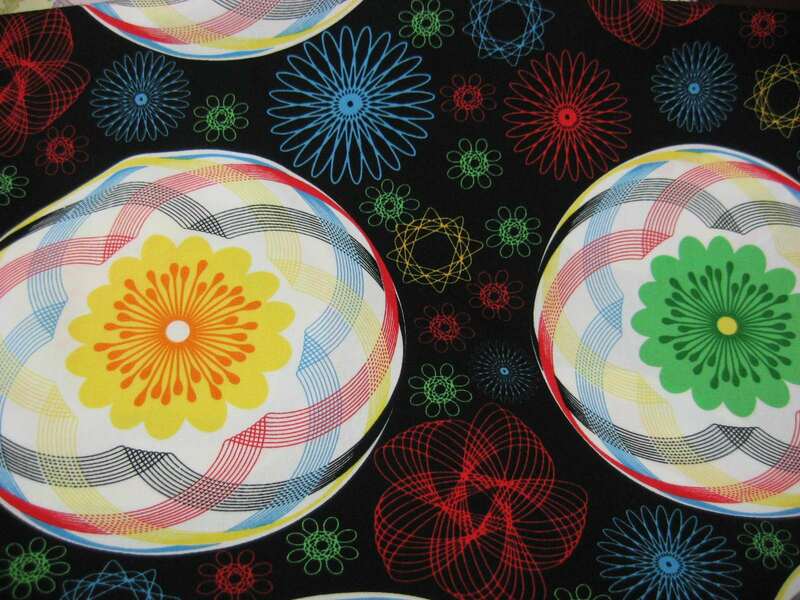 I LOVE, LOVE, LOVE, the spirograph fabric...so cool...loved playing with that! I have lots of knitting projects going and crochet too! My little granddaughter, Kira, starts Kindergarten on Tuesday too! Stay safe during this storm!